We all know that curb appeal is important to the look, feel, and resale of our home, but changing our home’s exterior is easier said than done. 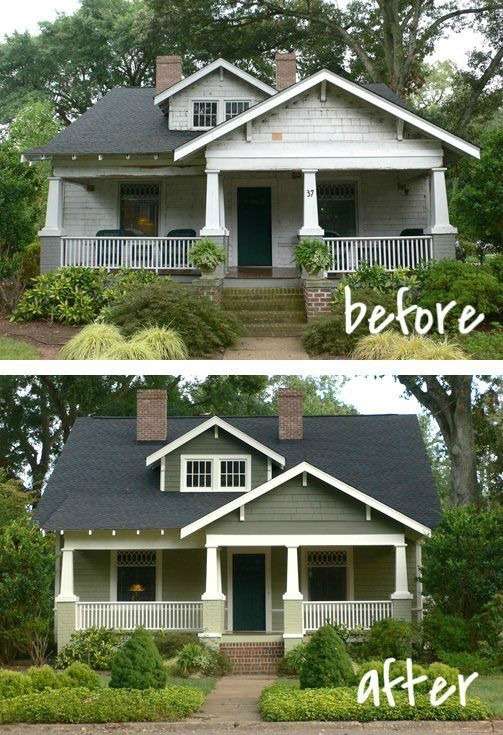 Whether you can only afford a few cans of paint, or whether you’re ready to completely renovate, these 20 home exterior makeover before and after ideas are sure to inspire! To be taken to the original picture source, click on the blue/gray text after each number. This home was renovated by Chip and Joanna Gaines on HGTV’s Fixer Upper. 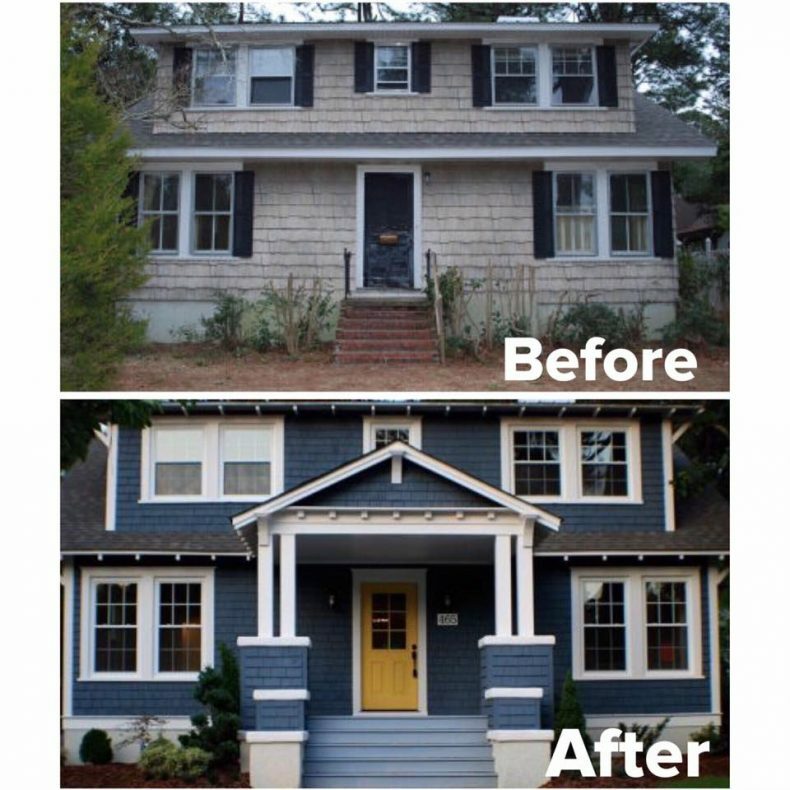 New front doors, wood shingles, wood shutters, square post columns, and a painting technique called “German Smear” completely transformed the look of this cape cod! This particular home was a hot topic of discussion on my facebook page due to the mixed opinions on painting brick. Want to weigh in your thoughts? Click here! Creating a beautiful exterior isn’t just about adding more; sometimes you need to scale back! 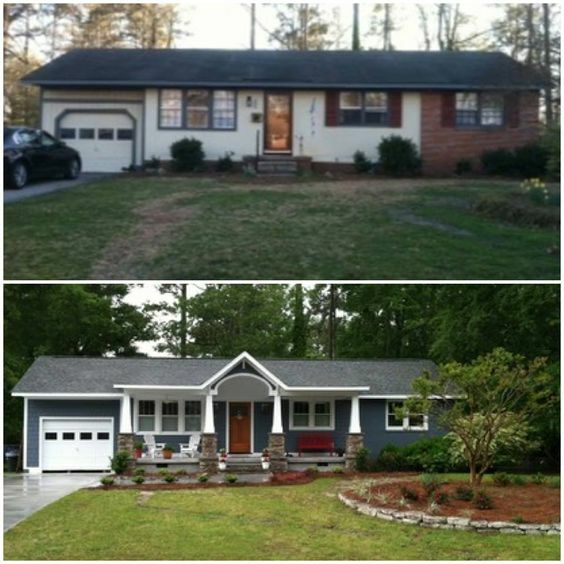 Removing trees and a few windows made a huge difference to the curb appeal of this southern charmer. This beautiful home just needed some extreme TLC. Very few structural changes were necessary to give the home new life. Sometimes the before and the after can be equally beautiful, and yet distinctly different. 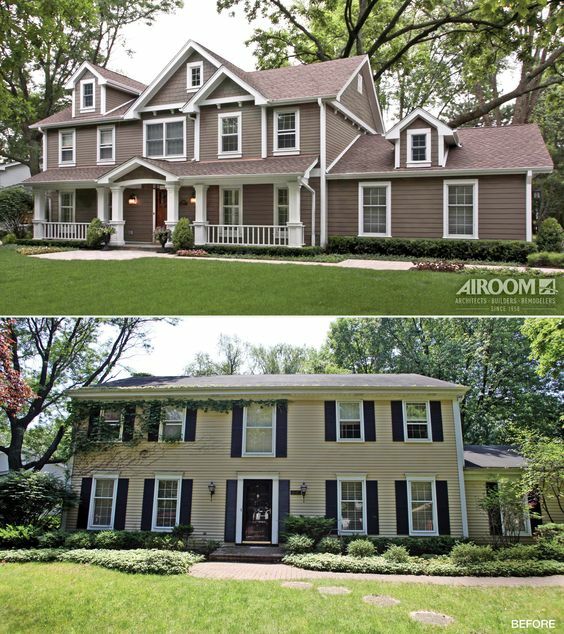 In 2008, Nester painted her brick colonial, replaced the shutters, and changed the front doors and entryway to create a completely different exterior! 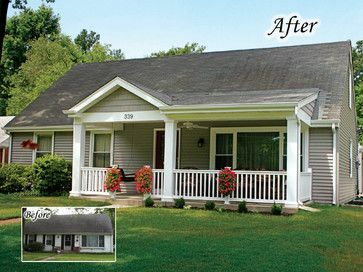 The addition of the portico porch dramatically changed the exterior of this ranch style home! Depending on the space, design, and contractor, a small porch addition can cost between $5000-$10,000. On this episode of HGTV’s Fixer Upper, the homeowners longed for a french country feel to their home. They picked this home trusting Chip and Joanna to deliver a French Country look to their sprawling ranch home, and the end result was amazing. Interestingly, this project also garnered mixed reviews because of the painted brick. Click here to see what people had to say! Simply beautiful! What a diamond in the rough! 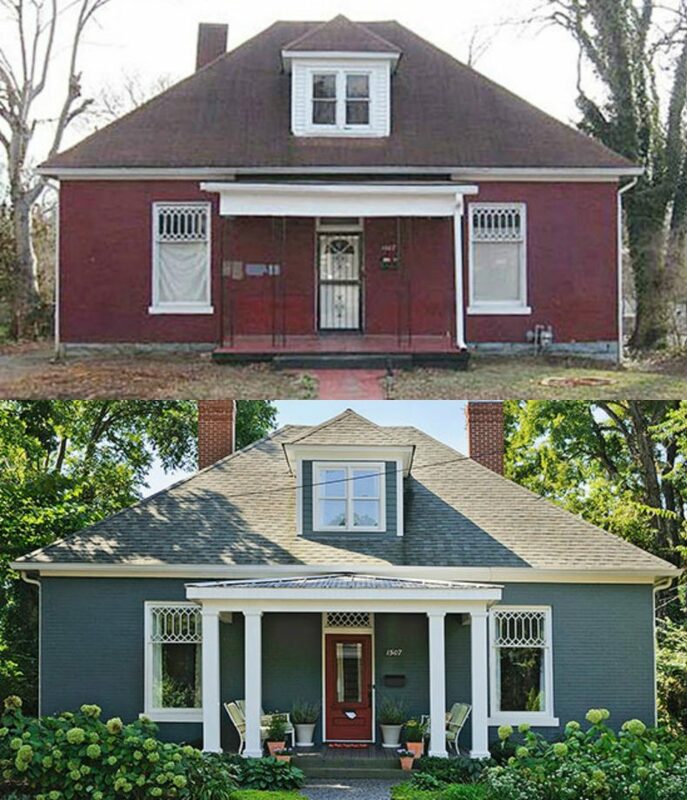 It’s such a joy to see neglected homes come to life again. 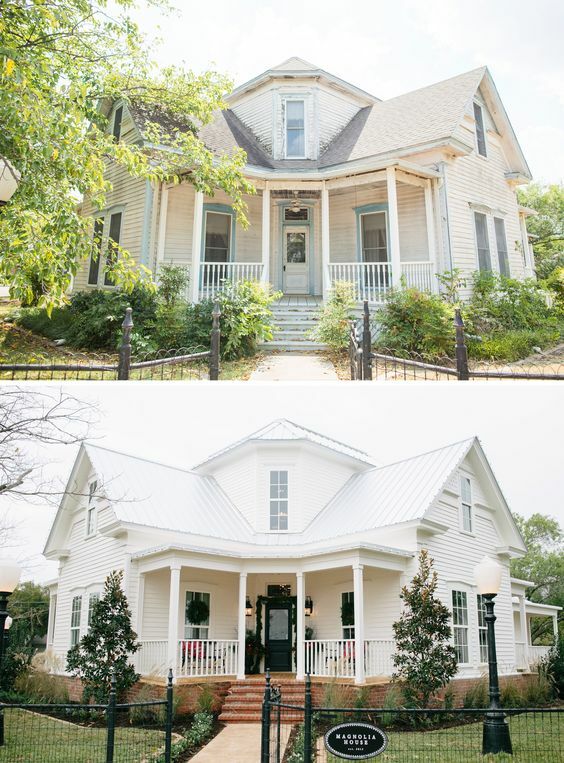 Chip and Joanna Gaines added dormer windows to the existing structure to give the illusion of a second story. She discusses it here on Magnolia. Love it? What would you have done differently? Click here to discuss! 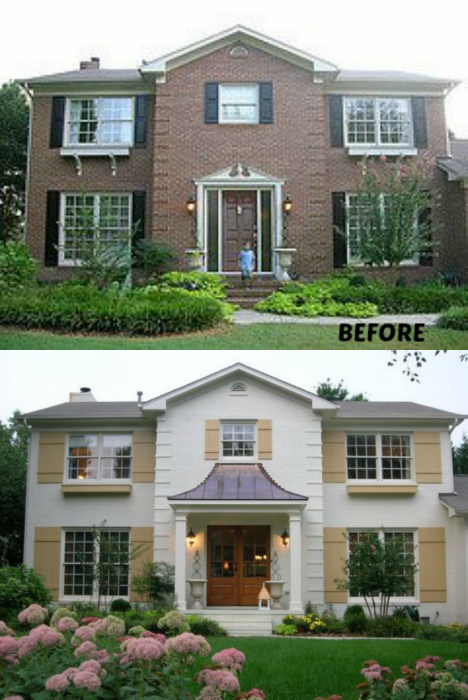 This exterior renovation is amazing! The addition of the gabled porch made a HUGE difference, but I also love the shutter removal, blue exterior, and yellow front door. Click here if you want to give your opinion on this one! You have to look closely to even see the how the “before” fits into the “after”! This is a completely transformed split foyer renovation. Fabulous job! Sometimes the best things are found underneath what another homeowner covered up! The original cedar shakes were found under aluminum siding. Read about it on Angie’s List. Wow! Porches to the rescue once again! If you’re looking for a beautiful way to spruce up your ranch style home, consider investing in a front porch. Gorgeous! 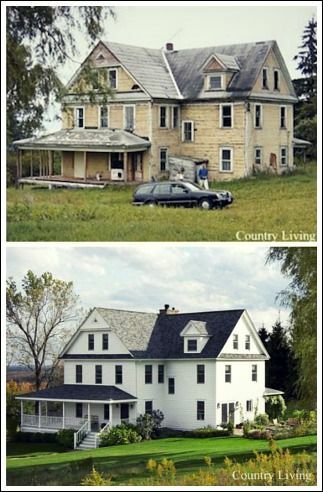 If you could afford it and had the time, would you buy an old home and restore it? Click here to give your thoughts! 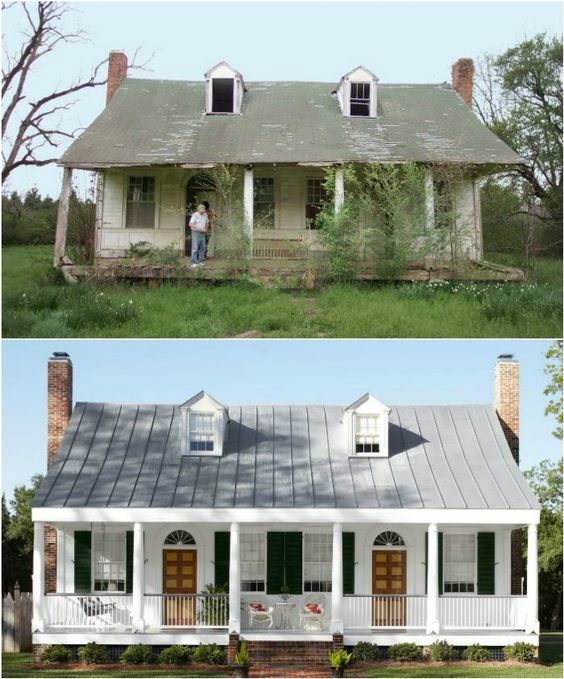 The homeowners wanted to restore their home to it’s original state, and the outcome is nothing short of amazing. The floor to ceiling windows and covered porch makes the space! 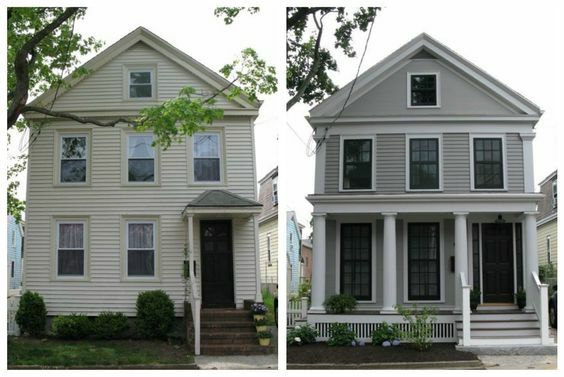 This colonial style home received a major renovation, and I’m torn between which version I like better! What do you think? Share your thoughts here. 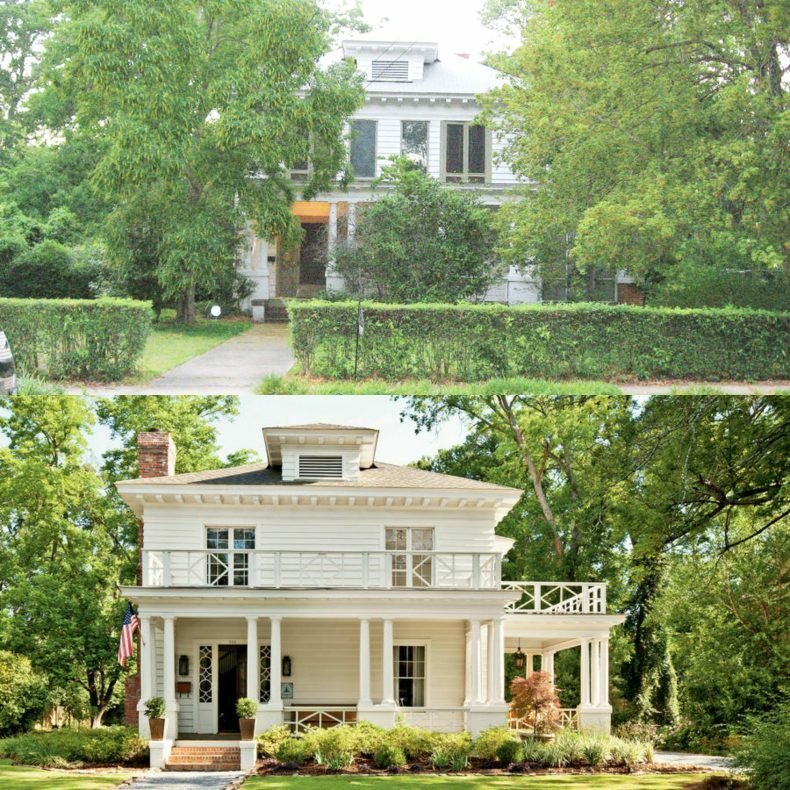 No before & after exterior makeover list is complete without the Magnolia House! I love the simplicity and clean look of the all white exterior and black door. 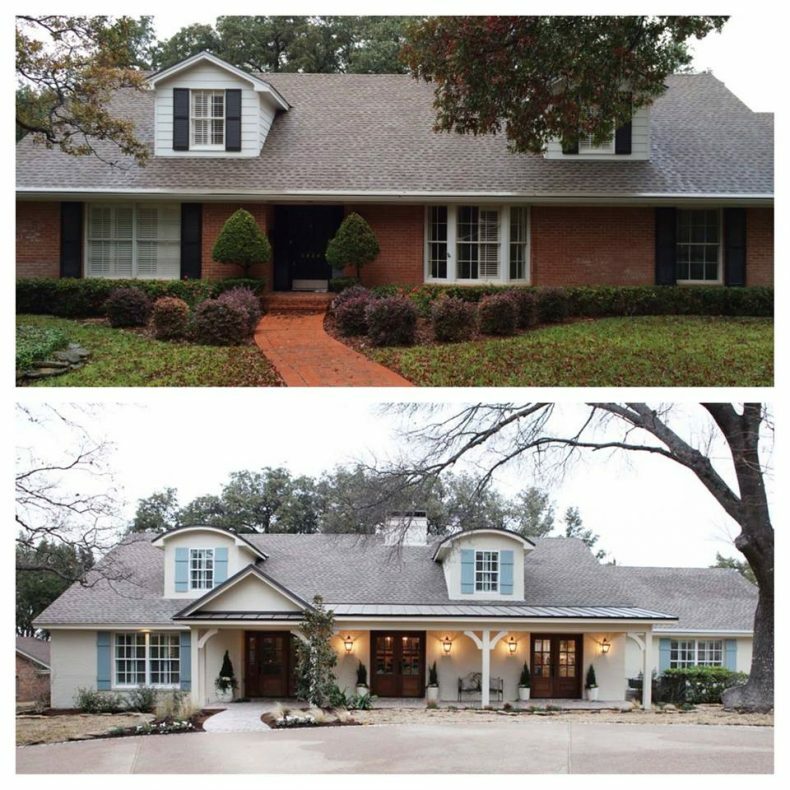 This is another gorgeous renovation found on HGTV’s Fixer Upper from Chip and Joanna Gaines. 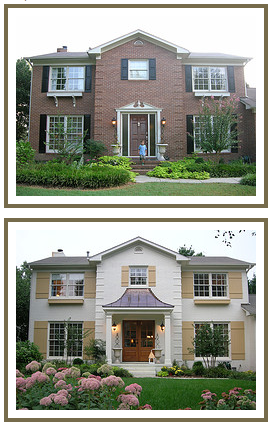 The painted brick, addition of the rectangular windows, new front door & porch transformed this exterior. The “before” of this home depicts a style of house commonly found across U.S. suburbia. If you have this basic style and are ready for an update, the “after” picture is fantastic inspiration! 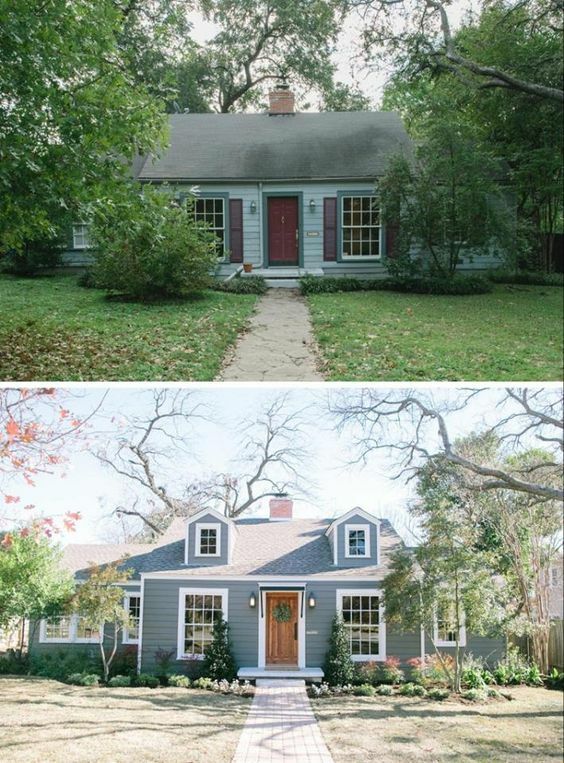 This is one of my favorite exterior transformations of the bunch. 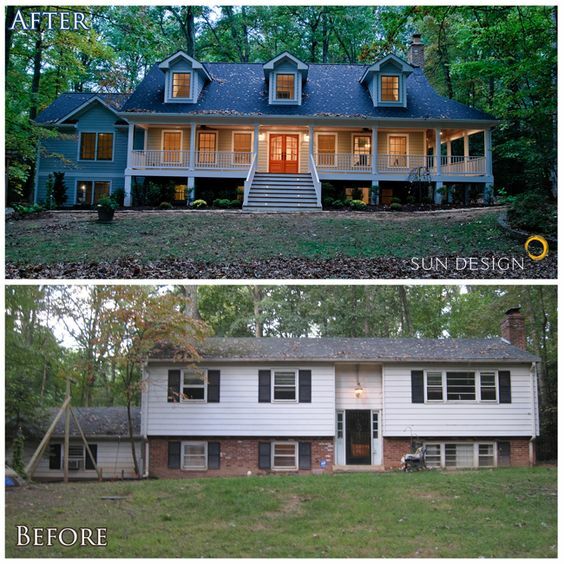 Typically a porch addition makes all the difference, but in this home’s case the porch elimination helped transform the home. Centering the door, removing the heavy awnings, and adding the widow’s walk made a huge difference. Oh, and let’s not forget that fantastic blue paint job! If you liked this post, be sure to follow me on Facebook where I share decorating and house inspiration every day ALL day! Beautiful renovations especially the painting of brick..I want to also paint my ranch brick house from brown,reddish to a white color as I recently changed my vinyl siding from buttet to bright white with all white trim..whats the pros and con for painting brick?? The pros are mostly visual–if you like the look of painted brick which I do! If your brick is deteriorating from age, painting may also offer a temporary fix and some protection from the elements. The cons are the upkeep and expense. Whether limewashed or painted, exterior brick will have to be updated as the paint begins to fail. Limewashing the brick will last longer than a latex paint application. Painted brick may fail after as little as 5-10 years and hiring someone to paint the exterior of a home is quite expensive. My home was built in the 50’s and I want to update roof and siding. 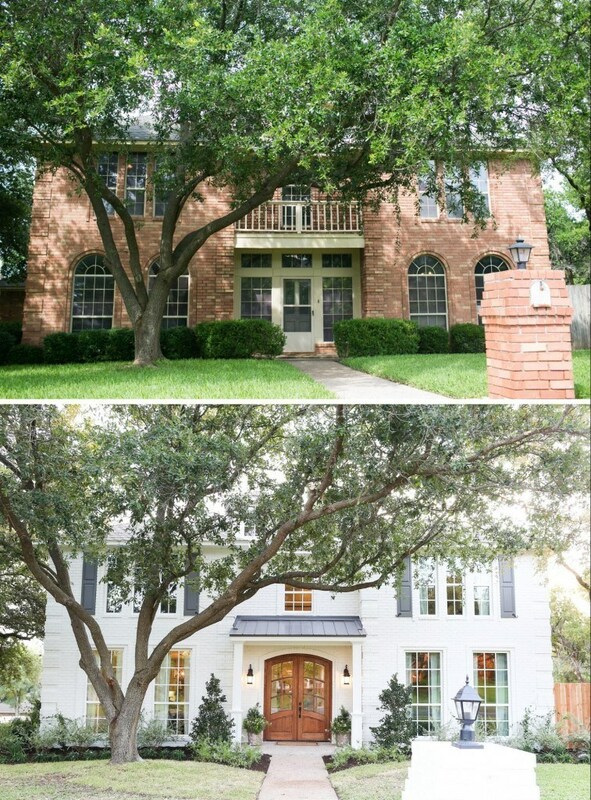 Where is a good web site to upload house pictures to get expert advice on color choice? 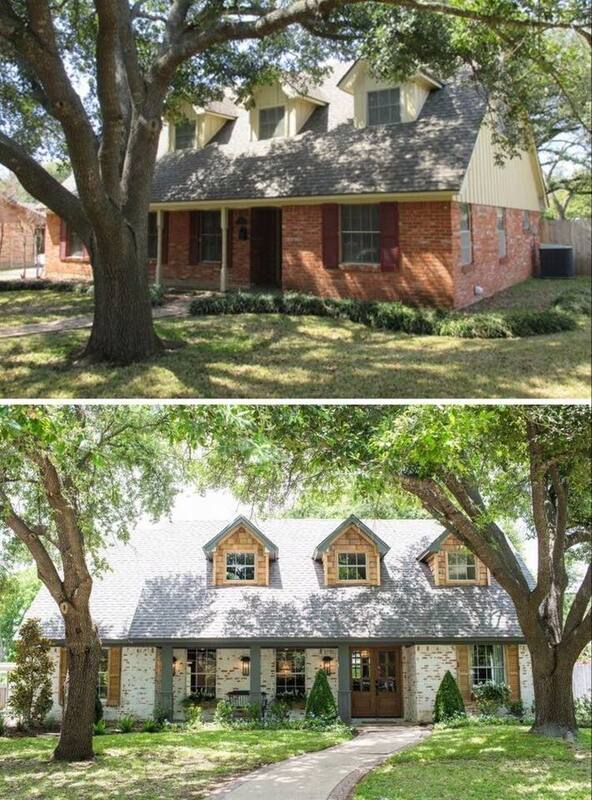 A lot of the houses in these before pictures look like they could never be the houses in the after photos. They’re so beautiful! Thanks for sharing these renovations! 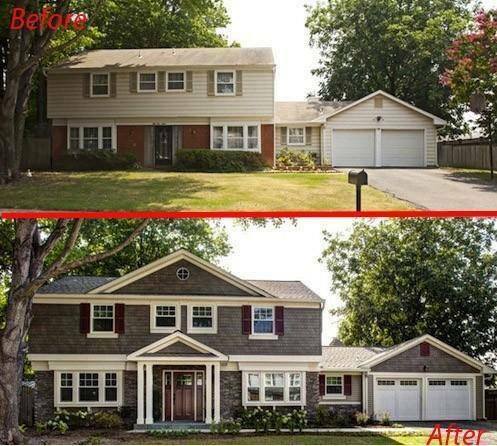 Amazing transformation!The exterior makeover is very beautiful. I want to look at the interior design for all of this. Thank you for sharing, you made my day happier looking at this inspiration posts. Honestly, we are thinking of renovating our home, but we don’t have a final decision yet. 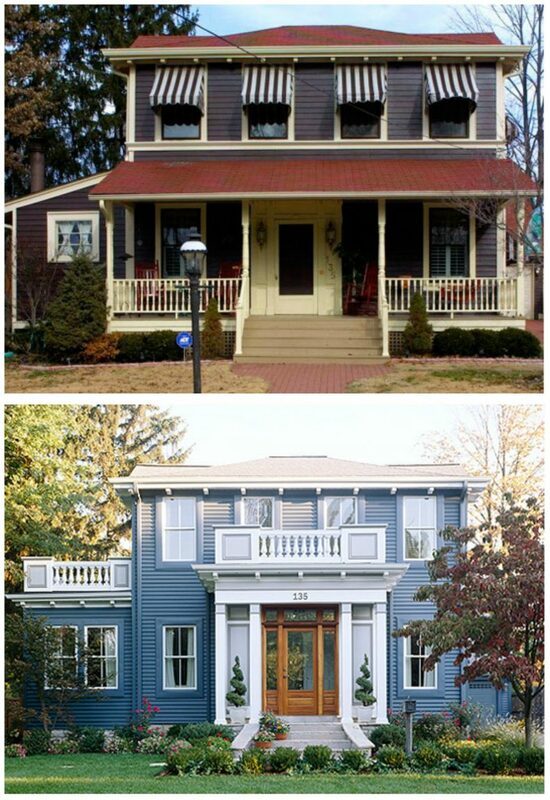 Do you have any tips for home exterior design? I would highly appreciate your help! Wow! These home renovations are amazing!